I am a flawed man but I do my best to do right and to seek justice. My oldest daughter Melissa has done many things to make me proud but I have to give her mother and other family credit for many of her good genes. What Melissa and I do share is a focus and intensity that borderlines on being obsessive and maybe at times a little reckless. Whatever labels you want to put on it, my oldest child has it, and she came by it honestly. There are many stories about Melissa’s drive. One of my favorites happened at a football game in 1998. Melissa was to be the featured majorette in the halftime show. Clouds were gathering as we drove to the game and by the time we got there it was pretty clear we were going to get wet. I was just hoping that maybe the rain would hold off until she got to perform. We made it to halftime with just a few sprinkles but as the band lined up to march on the field the wind picked up and the rain began to fall. By the time the band reached mid-field it was pouring. Melissa was out front and when the band set to play suddenly Melissa held up her hand and then she broke ranks and ran to the sidelines. I was disappointed for her because she had worked so hard getting this routine ready for homecoming. 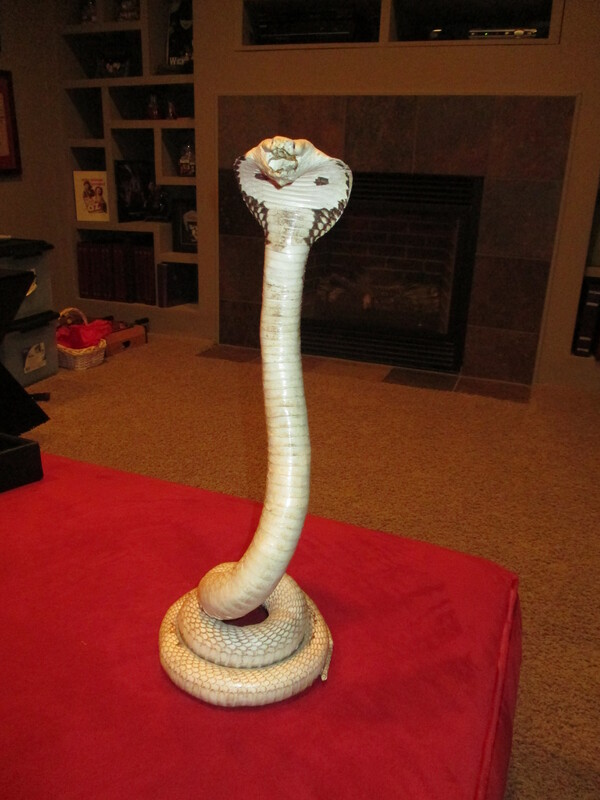 I of course was assuming that her part in the halftime show was called off. To my surprise Melissa ran to one of the football team managers and got a towel to wipe her hands. The band waited on her as she ran back on the field. She setup and signaled that she was ready. Now, there is no way that she should’ve attempted this routine in a driving rainstorm but even from 50 yards away I could see the focus in her eyes. I just knew right then that she was about to nail that routine and it did not matter how hard it rained. Most people would never have been out in front of a crowd like that in the first place and most of the rest would have called it off when it started to rain. Not Melissa, she was ready and 100% focused. As she went through her routine she threw that baton as high as she could, not once, not twice but five times catching all five. Wow! Now, Momma couldn’t do that, that there was Daddy’s genes! Okay, well, her momma was a majorette too but she would never have performed in a driving rainstorm. It still makes me smile just to think about it. That’s my girl! There are many things that Kristine and I have in common but more than anything else Kristine and I share a love of nostalgia. We like old stuff, old music, old books, and especially old photographs. Although she gets it from both sides of her family we both love taking pictures. A picture captures a moment in time that will never come again. When you take a picture, you create tomorrow’s nostalgia. We will always have that in common. Another thing we both have in common is we were both high school athletes. I was a pitcher in baseball season and a quarterback come football season. I was never as good as I thought I was, few athletes are, but I was pretty good and I loved to throw the ball. Kristina also loved to throw the ball. Kristina was also a fast pitch softball pitcher. When she was not playing softball Kristina was a cheerleader. 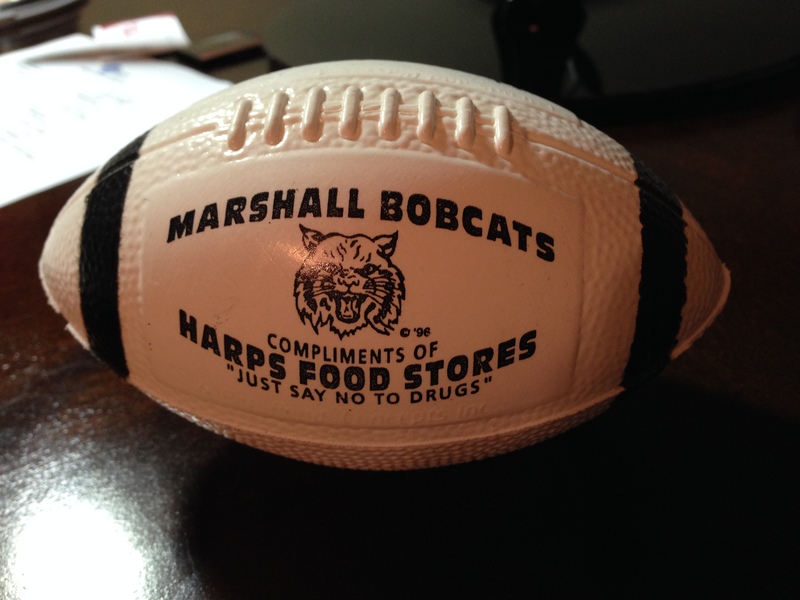 During football season every time the Marshall Bobcats would score the cheerleaders would throw souvenir footballs up into the stands. It was homecoming 2003 and I had told Kristina be sure and throw me a ball for a souvenir. We were a few minutes late to the game and as we arrived I saw the cheerleaders throwing balls into the stands. Now girls these days throw a lot better than the girls did when I was a boy. All of these girls were doing a pretty good job arching these balls up into the stadium. Unfortunately I wasn’t in the stadium and I was still a long ways off. I saw Kristina standing with a ball looking side to side like an NFL quarterback searching for the open man. I let out a hollered, “Kristina,” the second Kristina spotted me she step toward me and let rip a bullet that would’ve hit me square in the chest had I missed it. No arching, that was a straight shot. Yes sir, that there was daddy’s genes. I grew three inches on the spot. Kristina has accomplished so many things of far greater importance than throwing me a bullet pass with a plastic souvenir football, but you see, for me that pass was nostalgic. Like a photograph that pass was a reflection of my own childhood. Thanks Kristina for the souvenir ball and so many other wonderful memories. First Deer at 54, Better Late Than Never! The Warfords are a deer and turkey hunting clan and have been as far back as anyone remembers. All my life I have been hearing deer and turkey hunting stories. As a kid I tagged along on several deer hunting trips but was never present when a deer was killed. My father was in the Air Force and while we visited as often as we could we were rarely in Arkansas during deer or turkey season. We were in Germany from the time I was 13 (1973) until I was 16 (1976). I was home for only one deer season before my grandfather passed away in 1977. Little did I know that my first deer hunting trip would be my last for almost 40 years. From 1976 until 2006 deer and turkey hunting stories were rarely part of my life. Then in 2006 my oldest daughter, Melissa, married Heath Freeman. Heath is a hunter and comes from a family where women as well as men were hunters. It was not long until he had both of my daughters not only in the woods but killing deer and turkey. It was good to hear deer and turkey hunting stories again. It was after all part of our family heritage. The girls, especially Melissa have been after me to let them take me hunting. This past week I decided to make time to go hunting. I was counting on what my Pappaw called beginners luck and it showed up big time. We were on the deer stand about an hour when Melissa, who was acting as my guide, spotted a young buck that was not legal. I was watching the young buck when Melissa became very excited. “Dad, dad there is a big buck coming through the woods.” He is going to pop out. Do you see him, do you see him?” She was whispering but very excited and I was staring up and down the tree line, I could see nothing. I was breathing hard and my glasses started to fog up. I told myself, you better calm down or you are going to mess up. You know how to shoot, focus – sight picture, breath control, trigger squeeze. I was calming down but I still could not locate the deer. Finally I realized the deer was to my side almost behind me and my view was blocked by a cedar tree. There was a gap in the cedar tree’s branches where I might have a shot but the deer was going to have to move out a few more steps. He was an older deer and he did not get that way by being reckless. 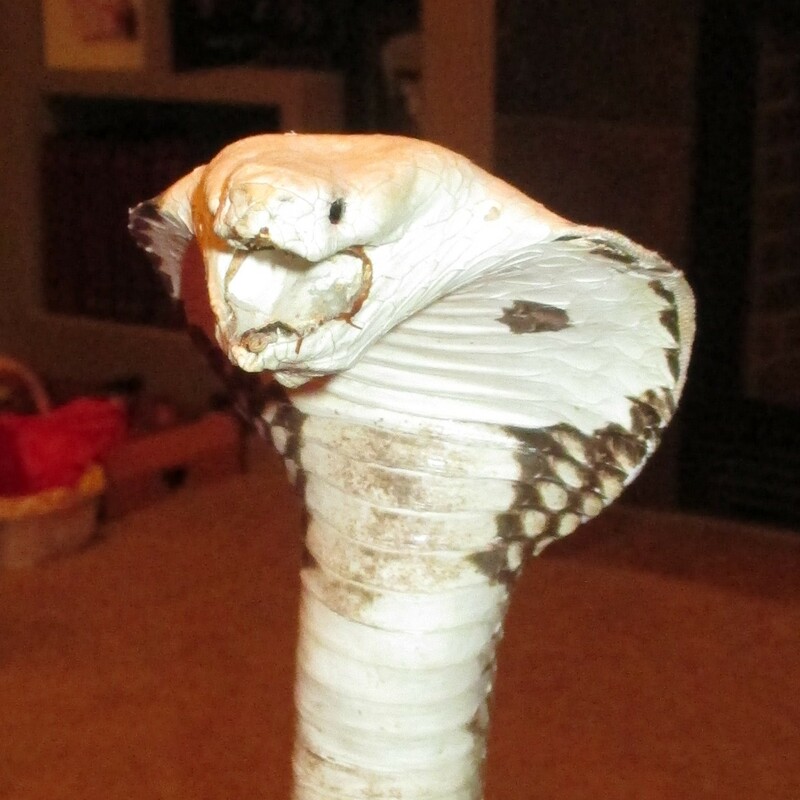 He looked back and forth before he moved as if he were about to cross a busy street. Finally he stepped from the woods right into the only spot where I could have taken the shot. Call it beginners luck if you like but everything went perfect. I squeezed off a shot and the deer bolted down the tree line and out of sight. I was sure I had hit him but he sure did not act like it. Melissa and I ran ten yards or so in the same direction he ran and then we heard a big crash. He had run thirty or forty yards, jumped a brush pile, a fence and fell. I had killed my first deer. It was a nice nine pointer. I think Melissa was as excited as I was. I know my Pappaw would be pleased and I sure was. It was a good hunt. When is turkey season? 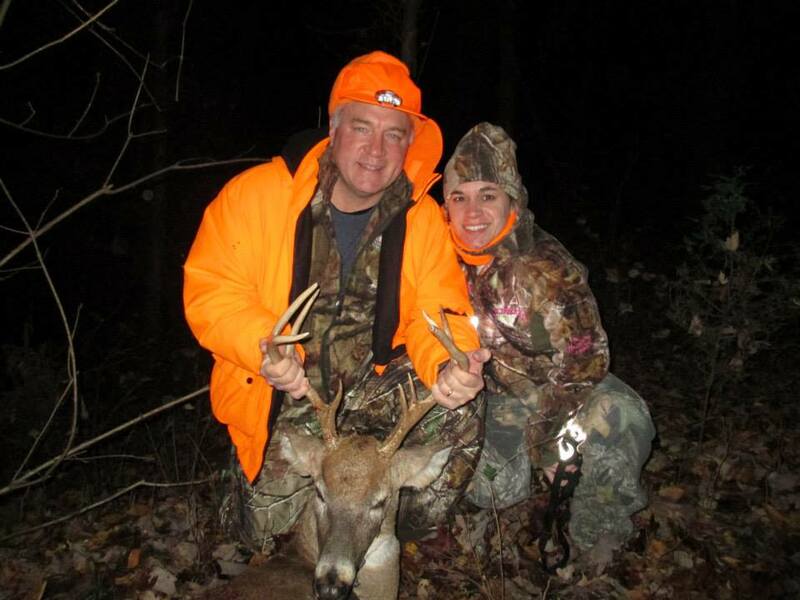 Lloyd Warford with daughter Melissa and his first deer. He or she is a chip off the old block; the apple (or acorn) does not fall far from the tree; like father like son; these are all idioms that express the same idea that children are often very much like their parents. The truth is every child is a twisted combination of the genes of two families not only do they take after Mom and Dad but the grandparent genes have a way of skipping a generation and showing up again. I, like most parent am proud of just about everything my kids do but also like most parents I am particularly proud when I see my kids do something that reminds me of myself. Each of my children has done things at one time or another that caused me to stand just a little bit taller and smiled just a little bit broader. These blog post are intended to one day be put together into a book for my children. One of the Chapters will be about the times when I was not only proud of my children but when I could see the reflection of myself in them. My youngest child Noah is fast becoming a very impressive young man. Noah like the rest of the family loves music and can eat his weight in cheese dip. He is a straight A student like his Mom and Melissa (his oldest sister) and reads voraciously and has an artistic flair like his other sister, Kristina. Noah is only eleven so he is still developing and trying to figure who he is and what he is going to be. It is exciting to see him exploring the world around him, and all the different possibilities. Whatever he decides to do with his life it is clear he has his Dad’s love of history. I would like to say I taught him to love history but the truth is I did not have anything to do with it. He taught himself. When he was just a little fellow he got a ruler as a prize at the fall festival at church. On this ruler were the faces of all of the American Presidents. Noah wanted to know who those men where and why they were important. He has taught himself all about the presidents. 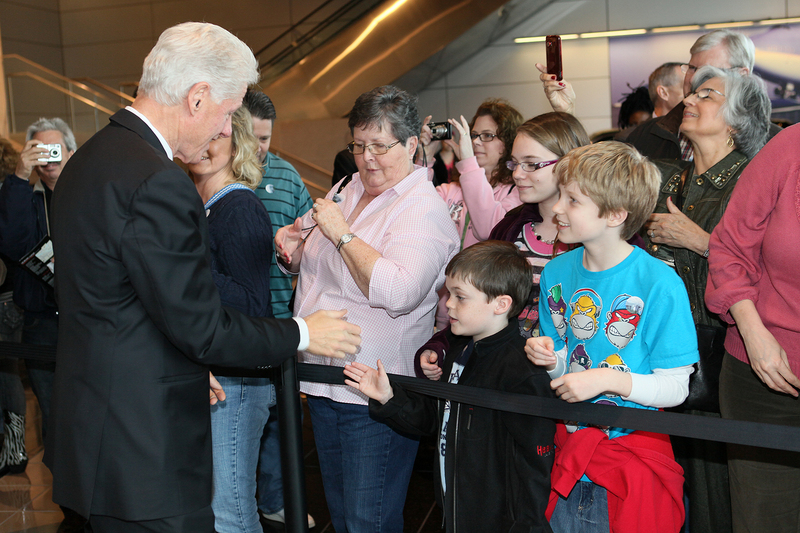 He has also learned about the first ladies. Whatever he does in life I think Noah will always have an interest in the people of the past and how government works. It pleases me that he and I share this area of interest and that he came to it on his own. It also pleases me that Noah cares about other people. This past week was Noah’s parent/teacher conference. All his teachers love him but one teacher went on and on about how he had used his share time to talk about bullying. He encouraged the other kids not to bully and to take up for others when they are bullied. Most of the other eleven years olds use they share time to tell of a new toy or a family outing. Noah used his time to try to influence the behaviors of his friends in a positive way. It was clear that Noah not only impressed his teacher he actually moved her. When we ask him about it he acted like it was no big deal. This story has been floating around in the back of my mind ever since we met with the teacher. Noah on his own initiative at eleven used his share time to tell a story in a moving way in an effort to motivate his class mates to respond in a positive way. Hmm, who does that for a living? Of course I first thought that is just like Dad. I am a lawyer and that is what I do. Then I thought that is also like his Grandpa Warford who was a Baptist preacher. It is also very similar to the many salesmen he has in the family like his grandpa Weir and great-uncle Chuck. Noah has boldness, a love of people and a persuasiveness that would help him be a great salesman, preacher or lawyer. Who knows what he might be but whatever he does I hope he will always keep his love of history. My Mammaw, Sallie Warford, was a true homemaker in the way few women are these days. No offense to anyone but my Mammaw raised three boys without benefit of many of the modern appliances we have come to regard as necessities. 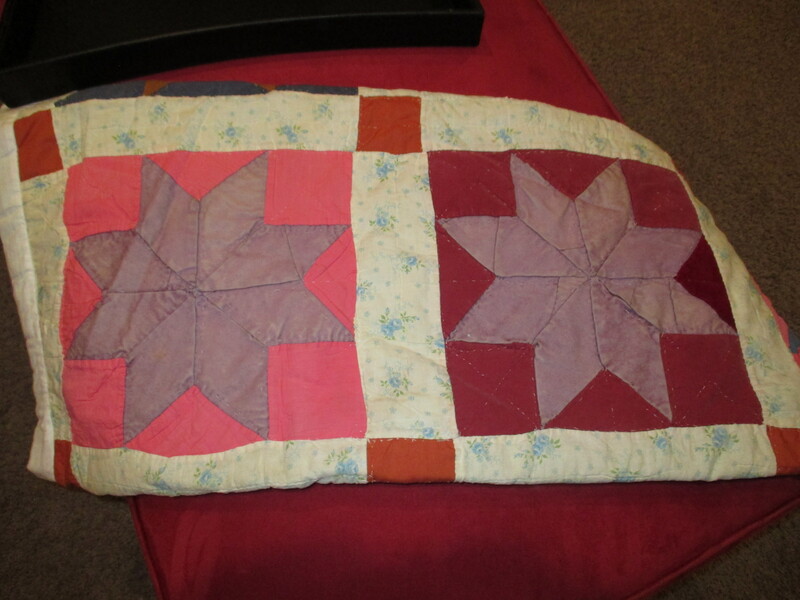 One of many things Mammaw did to care for her family was to make quilts. The picture above is of Sallie Warford with friends from the Lonsdale Arkansas Quilting Club. Mammaw is third from the left. It is a rough estimate but we suspect this picture was taken around 1949. What we know is we have a picture of Mammaw wearing this same dress in about 1949 or 50. Our estimate is far from precise because Mammaw was know to mend and wear clothes for years and years. The picture could just as well have been taken in 1959. 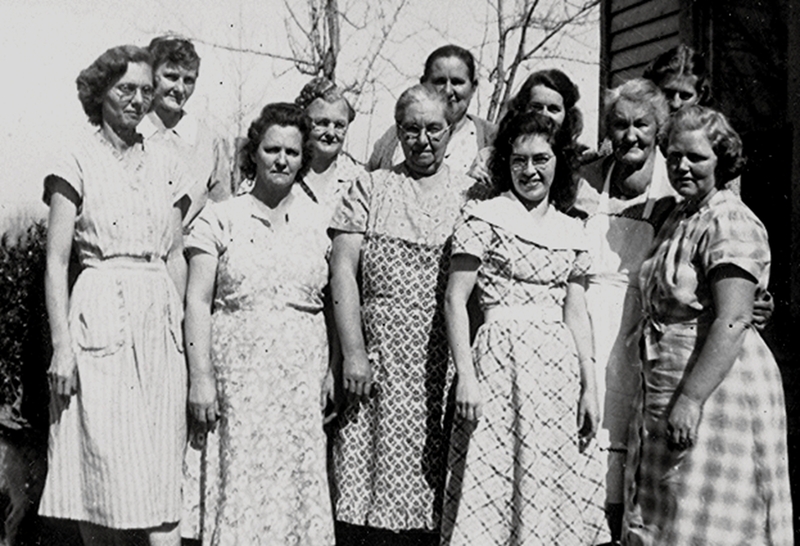 Mammaw’s ability to mend any fabric was legendary in the Warford family. In 1977 she came a stayed with us for a few days and one day she decided to help my mom with the laundry. Well, she discovered that my brother and sister and I had all sorts of clothes that had holes in them. Now most of these were undergarments and socks and the holes were in places no one would ever see. These garments were on there way to the trash can at our house but Mammaw could not stand throwing away these clothes. Mammaw insisted on mending every garment in the house. Where holes were to large to close with stitching she used an old tee-shirt to create a patch and plug the hole. The patches were strong and comfortable. No rough edges on the feet or bottoms of Mammaw’s family. For graduation in 1978 Mammaw gave me a quilt as a gift. This blanket was on my bed when I was single and after I got married it has always remained nearby. It has covered many house guest, hosted many picnics and been a play area for all my children. Eventually it was falling a part. One year for Christmas my wife, Mandy, found a women who was able to mend it and put it back in the same condition it was in when I got it. This was one of the most thoughtful Christmas gift I have ever received. The quilt is in the second picture – above right. It will always be one of my most prized possessions. Sallie Louise Teague Warford was my paternal grandmother. I called her Mammaw. Mammaw was born February 12, 1910, at least that is what she reported throughout her adult life but census records actually call this into question. Sallie Teague show be listed with the rest of the family in the 1910 census but there is no Sallie Teague. The census does however show a Nellie Teague age 1. This raises several possibilities. Was Sallie originally called Nellie? Was Nellie another child that died before reaching her first birthday? Could Sallie have actually been born in February of 1910 or later? Did the census taker just write the name down wrong? On ancestry.com some family trees list Nellie as a child that was born and died in about 1909 and shows Sallie being born about the same time. Other family trees list Nellie as an alternative or second name for Sallie. It is not uncommon for names to be miss-spelled or misunderstood in the handwritten census records of the early 1900s but that seems unlikely here for two reasons: first, because the name is very clearly written in 1910 (it is definitely Nellie) and second because Nellie was a family name. In fact, Sallie had an Aunt Nellie that was 11 years old in 1910. I was hopeful that the 1920 census might resolve the question but it is anything but dispositive. The 1920 census does not show a Nellie Teague at all but shows a Sallie age 10. Again that could be because Nellie was Sallie or because Nellie had died and Sallie was not born until 1910. If Sallie was born in February 1909 then she would have been 10, on January 1, 1920 but would have been 11 when the census was completed in May 1920. If Sallie was actually born in February of 1910 she would have been 10 when the 1920 census was taken. So, the 1920 census could support either possibility. There are many possible explanations but the two most likely explanations are either that Sallie was originally called Nellie and it was changed for some reason or Nellie was a different daughter, and Sallie was not born until 1910. If anyone out there knows the answer or has proof of Sallie’s birth date or proof that Nellie was or was not a separate daughter, I sure would like to know the answer to this mystery.